Hello everyone and thanks for stopping by my Craft Corner! How has your week been? Mine has flown by as I'm trying to get back into the swing of things now that the holidays are over. 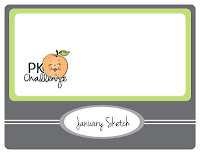 I hope you've saved some crafting time for this weekend because I have a fun challenge to share with you today. Ready for another great Peach Keen Stamps Challenge? * I stamped my sweet little bear onto Kraft paper and inked up the edges a bit. His eyes are colored in with gel pens and I gave him some rosy little cheeks. * The pjs are paper pieced using some sweet October Afternoon paper. Create a card or layout of your choice following the sketch provided. That's all for me today - thanks again for stopping by and I'll be seeing you soon! Tanya, that is so cute! The bear is adorable and I LOVE those pajamas. Love all the details but those pjs...the cutest. I adore your take on the sketch. Your little ragamuffin bear and his patchwork pjs is so stinking cute. Love that you crinkle ribboned that oval detail on the sketch. Your big creative mind sees things the rest of us mere mortals miss. PK is lucky to have you on their team. Love your card, Tanya! Your bear is beyond cute!! Very pretty paper you've used for the P.J.'s. 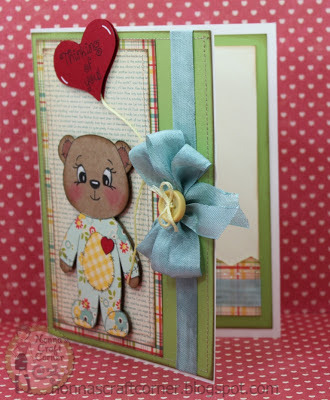 Oh My Goodness - this is so super cute Tanya - I love that little bear! TFS and have a great weekend. Oh my goodness! This little guy is soooo cute in his pj's!! Sweet card! Super cute. Love your card and the paper piercing you did. Your card is so adorable Tanya. I love the cute pajama's!! So cute...love the little PJ's! Your card is way too cute, her jammies are adorable! TFS! This is precious! Love the card and love what you did with the sketch! Tanya ~ OMGOSH!! IU LOVE this bear and the jammies too! So CUTE and CLEVER!! Of course the ribbon/bow is just PERFECTION!! I TOTALLY can relate to your post! Just when I start getting back into to it ~ the little one gets sick! So hopefully next week ~ I shall return! So happy you did! Have a wonderful weekend! I am so in love with that CUTE, little bear!!! :) And you do such a great job paper-piecing his pj's!